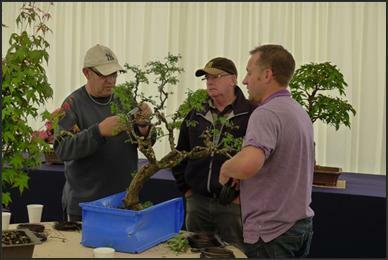 The club is affiliated to the National Federation of Bonsai Societies. 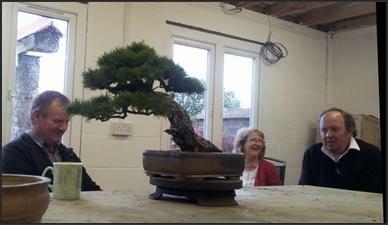 so that there are an infinite number of bonsai events that one can attend all over the country. Our club meetings are informal, and visitors are welcome at any meeting. to cover tea or coffee and biscuits. Visitors pay £2, until they decide to join. Extra fees may apply for special events. direct from the car park. 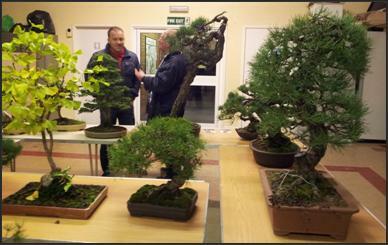 This is a typical club night, with a quite a few bonsai brought in by members. This photograph was taken at our annual club show, which was held at Dyffryn Gardens. working on their trees over the course of the wweekend . for particular activities and events.